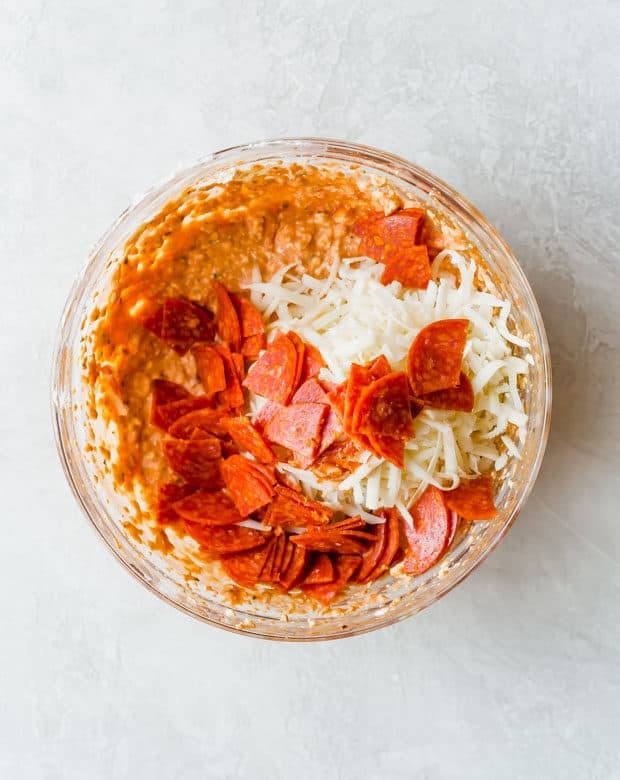 This Pepperoni Pizza Dip is super cheesy, creamy, and bursting with all the pizza flavors! 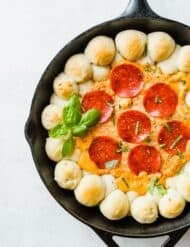 Little pizza dough balls along the perimeter of this pizza dip make for one of the best pizza appetizers you’ll ever have! 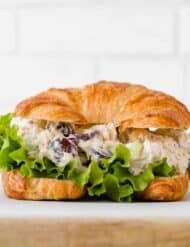 Are you looking for more game day food? 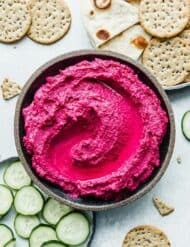 You can never have too many appetizer recipes! Honestly, finger foods are my favorite! 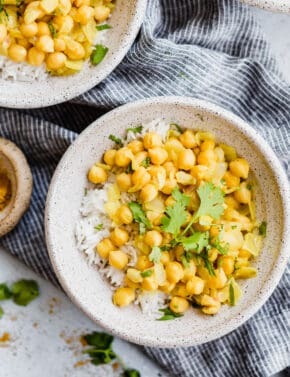 All of the above recipes would be PERFECT to eat while you’re watching football! And As college football bowl games are fast approaching I thought I’d share another finger food/appetizer recipe with you! This pizza dip with cream cheese is soooooo good! It has dough balls that are rolled in a garlic infused olive oil and then baked to perfection. You can’t say “No” to that! In your 12 inch cast iron skillet heat a tablespoon of olive oil over medium low heat. Add 3 cloves or minced garlic to the olive oil. Let the olive oil and garlic cook for a minute or two or until the garlic becomes fragrant. 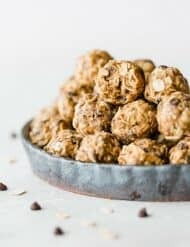 Transfer this to a small bowl. We’ll come back to this in just a moment. Make (or buy) pizza dough. I have the perfect homemade pizza dough recipe. It’s fool proof. 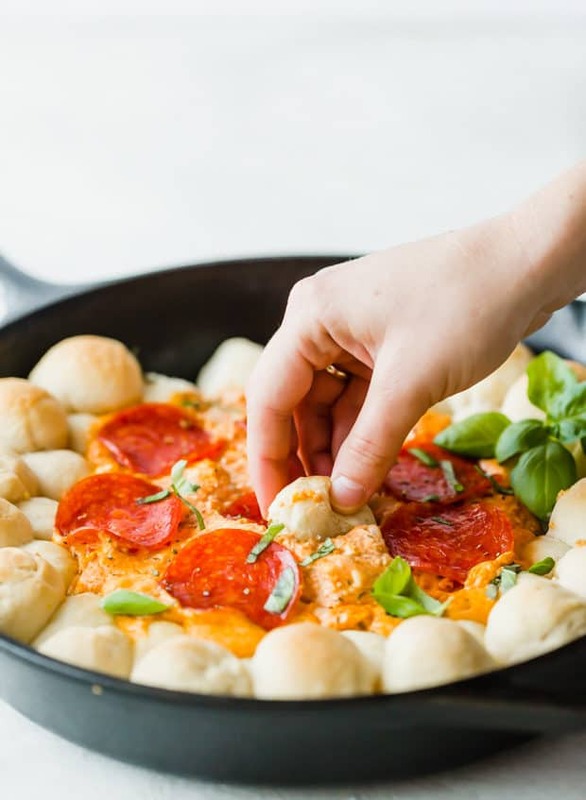 If you make my homemade pizza dough you’ll only need about half of the batch for this pizza dip recipe. However, I rarely half the recipe because I’ll place the pizza dough in the fridge (wrapped in plastic wrap), and we’ll make a thin crust homemade pizza the following night for dinner. You’ll need about 18 oz of pizza dough. Shape the dough into a a rough 8″x8″inch square. Cut the dough into 36 pieces, about 1/2 oz each. Roll each piece into a ball and then dip the pizza dough balls into the garlic infused olive oil. <— SO good!! 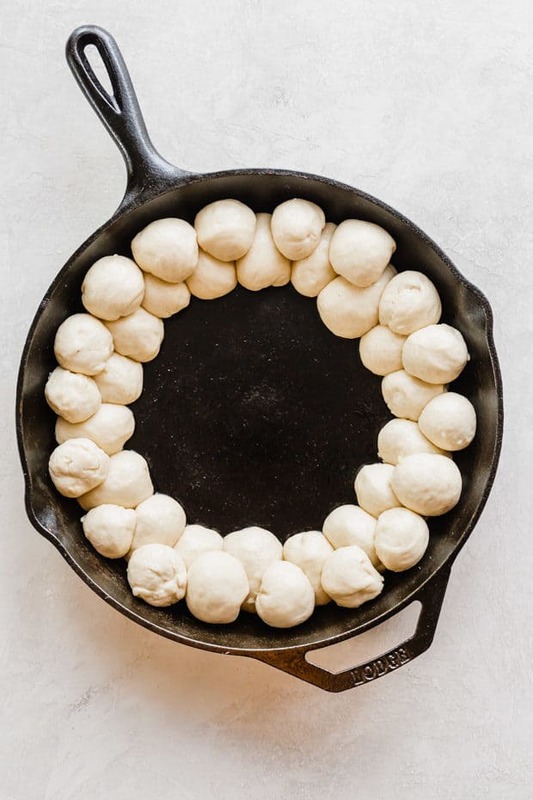 Place 18 pizza dough balls around the perimeter of your cast iron skillet. Then place an additional 18 balls on top, staggering between the seams of the balls underneath. Keep the center of the skillet empty. Cover the skillet and let the dough balls rise for 45 minutes to an hour. After the dough balls have risen it’s time to bake! Pop the skillet in the oven for about 20 minutes. Bake until the pizza dough balls have a gentle golden brown top. Remove the skillet from the oven and place the pizza dip mixture in the center. Thoroughly mix the pizza dip mixture until it’s smooth. 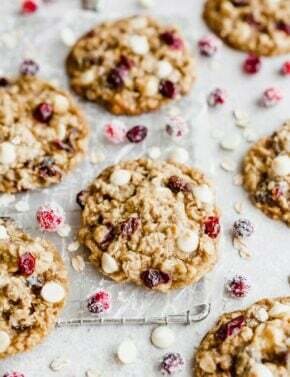 You can use a spoon to do this or an electric mixer. I opted to use hand beaters because it’s faster and easier. ? Once the creamy dip is combined, spoon the mixture into the center of the skillet. 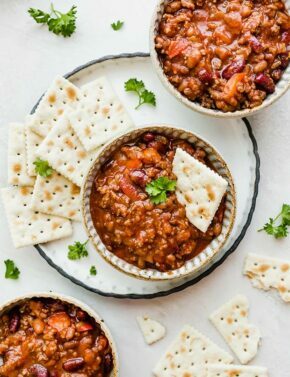 Top with chopped or whole pepperonis. I used whole pepperonis, but you can scatter chopped ones along the top as well. Either works just fine. Remove the dip from the oven and top with fresh chopped basil. Serve immediately! This is an easy pizza dip recipe that EVERYONE will go crazy for! 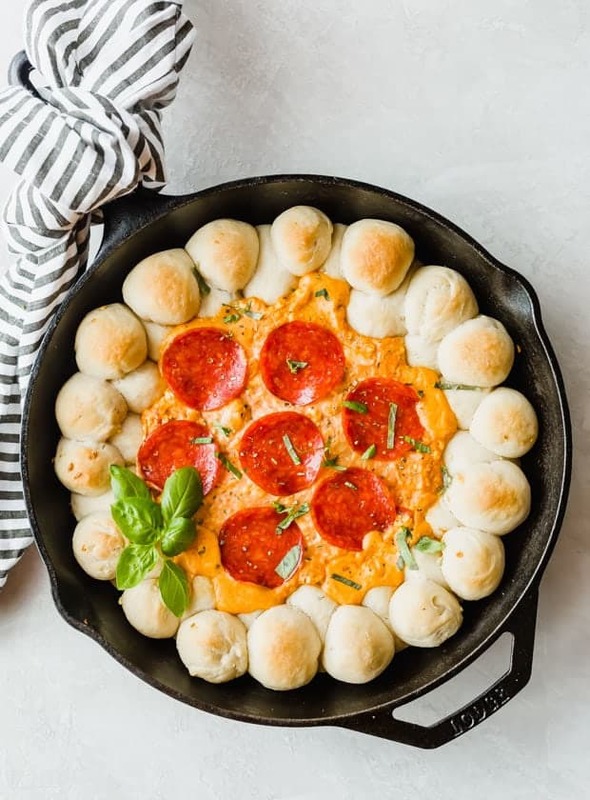 This pepperoni pizza dip is the perfect appetizer for parties and game day! In a cast iron skillet over medium low, heat olive oil and garlic until garlic is fragrant about 1-2 mins. Transfer the oil and garlic to a small bowl. Place the dough on a lightly floured surface. Pat or roll the dough into a rough 8x8 inch square. 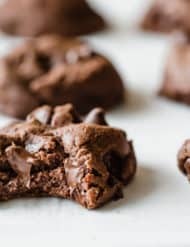 Cut the dough into 36 pieces, about ½ oz each. Roll each into a ball, and then roll each ball into the garlic olive oil. 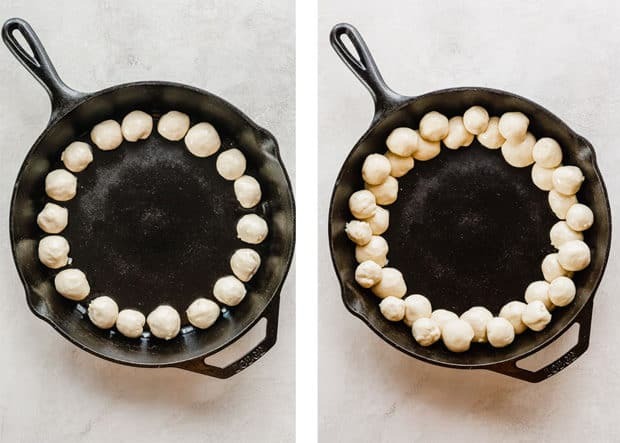 Place the olive covered balls around the edge of the cast iron skillet. 18 balls around the outside of the skillet. Place the remaining 18 balls on top, staggering between the seams of the balls underneath. The center of the skillet will be empty. Cover the skillet with plastic wrap, and let sit for 45 minutes or until the balls have puffed up slightly. Meanwhile, Preheat oven to 400°F. Move the oven rack to the middle position. Remove plastic. Place skillet in the oven and bake for 18-22 minutes, or until the balls are a bit golden brown on top. While the skillet is in the oven, place the cream cheese, pizza sauce, oregano, and dried basil in a medium size bowl. 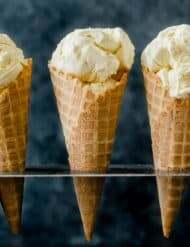 Use an electric mixer to beat until the mixture is smooth. Stir in the shredded mozzarella and ¾ of the chopped pepperonis. Remove the skillet from the oven. Spoon the cheese mixture into the center of the skillet, and return to the oven to cook for 8-10 minutes or until the cheese mixture is heated through and the rolls are golden brown on top. Remove the skillet from the oven. Top with remaining pepperoni and fresh chopped basil. Serve warm. *You don't have to use a hand mixer to mix the cream cheese and pizza sauce. I did this because it was faster/easier. 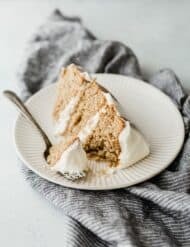 You can use a whisk. You just want to make sure you thoroughly combine all of the ingredients. I’ve never made pizza dip before but wanted to try this recipe before the college football bowl games start. 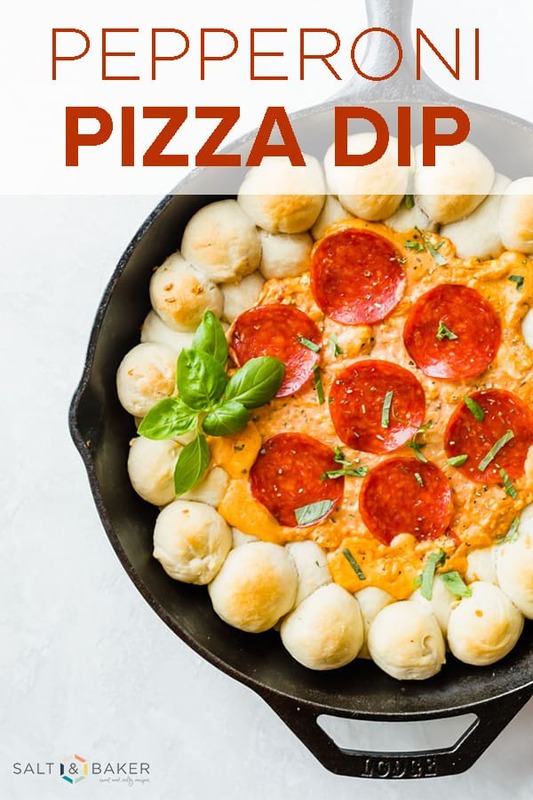 This is the BEST pizza dip! It totally passed the test. I’ll be making it again for the upcoming game day parties and even the Super Bowl 🙂 Thank you thank you!